제11회 서울재즈페스티벌 출연 아티스트 관련하여 안타까운 소식을 전해드립니다. 5월 28일(일) 출연이 예정되어있던 자미로콰이(Jamiroquai)가 리더 제이 케이(Jay Kay)의 급격히 나빠진 건강상의 사유로 서울과 일본 공연을 진행하기 어려운 상황임을 알려왔습니다. 여러분의 양해를 부탁 드립니다. 또한, 28일 일요일 자미로콰이(Jamiroquai)의 공연시간은 혼네(Honne) 공연으로 진행됩니다. 자미로콰이를 기다린 분들께 불참 소식을 전해드리게 되어 진심으로 유감스럽게 생각하며 제이 케이의 빠른 쾌유를 바랍니다. 자미로콰이 불참으로 인해 28일(일) 또는 2일권 티켓취소를 원하실 경우 전액 환불 조치 해드리겠습니다. 28일(일) 1일권, 2일권 예매자에게는 관련한 안내문자를 발송드리며 연락처 변경 등으로 인해 문자를 받을 수 없는 관객분들께서는 인터파크 콜센터 1544-1555로 연락 주시기 바랍니다. We have an important announcement for fans and customers of the upcoming Seoul Jazz Festival. 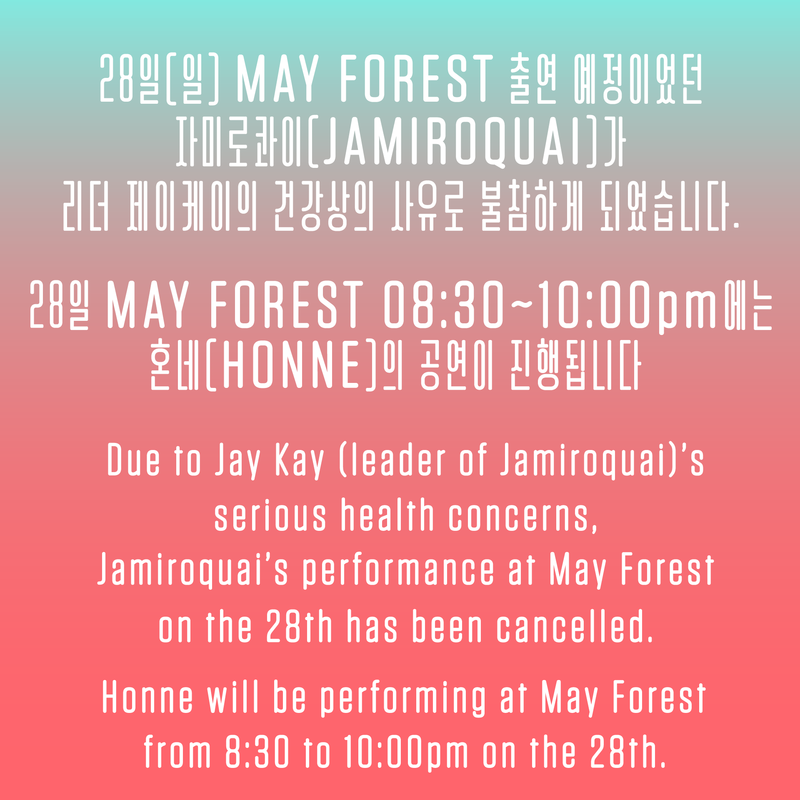 Unfortunately, due to Jamiroquai leader Jay Kay’s serious health concerns, we have been informed that Jamiroquai will no longer be able to perform in Japan and Korea, including the Seoul Jazz Festival set on May 28th (Sun). We wish Jay Kay a speedy recovery, and thank the fans in advance for their support, and understanding. 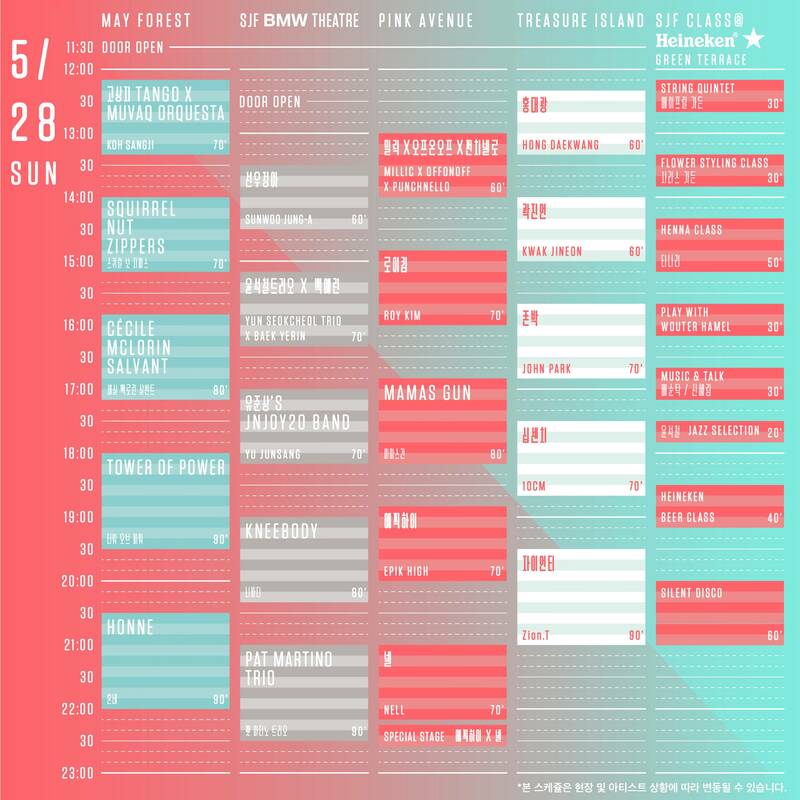 Additionally, we would like to inform you that Honne will be performing instead of Jamiroquai on Sunday. Again, we regret to inform this news to all the fans who waited to see Jamiroquai at the Seoul Jazz Festival, and we send our very best wishes to Jamiroquai. If you would like to cancel your 2-Day Pass, Sunday 1-Day Pass, we will issue a full refund. A text message has been sent to 2-Day Pass and Sunday 1-Day Pass holders, and if you haven’t received a text message, please call Interpark at 1544-1555. If you have any further concerns, please email us at sjf@privatecurve.com.